For 30 years, the Swiss systems integrator A&F Computersysteme AG has been a proven expert for publishing solutions. Therefore A&F has now also officially included VIVA’s solutions in its portfolio. With VIVA solutions, A&F offers its customers completely new possibilities and With the VIVA solutions, AF offers its customers completely new possibilities and completes its portfolio in the areas of corporate/cloud publishing, web-to-print and database publishing. SoftwareONE helps customers manage their software portfolio efficiently. With its headquarters in Switzerland (Stans) and branches in 145 countries, 3000 technology consultants help customers optimize their software portfolio on a daily basis. The consultants have extensive technical and commercial know-how and have a broad knowledge of (and relationships with) all major software houses. cobra GmbH has positioned itself in the education sector. Software, equipment and more to the education stage especially for school and education. Cobra is the portal for teachers, lecturers, pupils, students, course participants as well as schools and educational institutions for software and selected hardware to the “education tariff”. Educational institutions as well as their teachers and pupils, students as well as seminar participants can save up to 90% on product prices at www.cobra-shop.de (in relation to the purchase of the software or the device at the regular price (recommended retail price of the respective manufacturer). For 26 years, the company has been making education digital. As a leading German trading company in the field of education, co.Tec offers over 157,000 customers a broad, educational high-quality range of PC and Mac software as well as hardware for school, education and further education. The Rosenheim company is thus the contact point for schools and teachers when it comes to digitalisation or hardware and software equipment for the schools. As a distributor for research and educational products, c&H Ausbildungsmedien Distribution GmbH is a competent and reliable logistics centre for software manufacturers. c&H’s tasks include constant contact and close cooperation with manufacturers, the definition of school products (school prices and license forms) as well as the appropriate “refining” of standard software products. The broad distribution of the research and teaching products takes place via their own distribution channel to authorized school product businesses. Printplus AG is the leading supplier of branch software for printers and publishers (MIS, Management Information Software). The Swiss market leader for MIS-Software (Management Information Software) has 40 employees in sales, organisation consulting and software development. Printplus is in use daily with more than 400 customers and over 5000 workstations in Germany, Austria, Switzerland and Liechtenstein. With standard interfaces, the PrintPlus printer portal DRUCK and Viva are completely integrated for the users. They have the possibility of creating all their layouts with VivaDesigner, from business cards to a multi-page employee magazine. The templates created in VivaDesigner are directly integrated in the printer portal. Here the user selects the product, completes the layout in VivaDesigner and puts it in the shopping basket of Printplus DRUCK. Depending on the task and the working method, the documents may be created graphically in the browser with the “VivaDesigner Web Edition” or in form mode with the “VivaNWP Designer”. Both interfaces are included in the standard interface of Printplus DRUCK. O/R/T/ Medienverbund is a classical service provider with its own software development, covering the complete spectrum of Pre-Press, Print and Post-Print as well as developing database workflow tools for their customers. For many years, O/R/T/ Krefeld has been providing the catalog print data for the tour operator Alltours in Düsseldorf. With Viva’s support, Alltours catalogs are produced by O/R/T/ using the Viva Network Publishing technology. O/R/T has integrated the Viva Publishing Server technology in its MMS (Marketing Management System), with which users can create documents fully automatically with a single keystroke. Noxum develops and markets standard and individual software for Web systems/Web portals, E-Business, Product Information Management, Cross Media Publishing and technical communication as well as Cloud Computing solutions in Microsoft Azure. The Noxum Publishing Studio combines an XML-based system solution with a content management and publishing system in one product. As one of the leading suppliers of XML solutions, Noxum provides not only consulting but also the development, implementation and support. 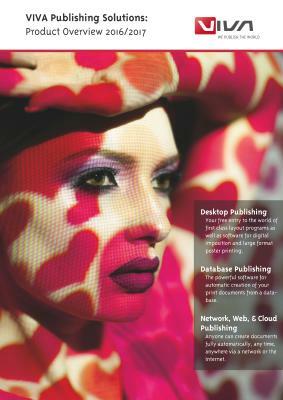 The Noxum Publishing Studio can read, interpret and manage a Viva XML document. Furthermore, the software is able to create completely new documents based on the Viva XML format. Spirit Packaging Premedia GmbH offers manufacturers of consumer goods and packaging materials pre-press services, analyses and optimizes work flows, works out technical standards and adapts business processing software applications, thus creating a complete integrated solution for its partner corporations. Spirit has integrated the Viva Publishing Server technology in its business processing software to create print-ready documents straight from the application.